This has got to be one of the strangest photos I’ve ever taken. Three weeks ago after visiting Sam A. Baker State Park (and photographing the scorpionfly featured in last week’s One-Shot Wednesday post), my dad and I visited a couple of sand prairie remnants in the Mississippi lowlands of extreme southeastern Missouri. I was hoping to see (and photograph) some individuals of the unique population of Cicindela scutellaris that occurs in that part of the state—apparently disjunct, this populations shows an intergrade of characters typical of subspecies C. s. lecontei to the north and C. s. unicolor to the south. I’ve photographed this population before, but those photographs were taken with a small (though quite good) point-and-shoot camera before I acquired my current dSLR camera setup. Unfortunately, temperatures were quite cool that day, and no beetles were seen at either of the two locations we visited where I’ve seen good populations in past years. When I don’t find what I’m looking for, I start noticing other things, one of which was this very fresh-looking bee fly (order Diptera, family Bombyliidae) resting on the sandy ground. I’ve not really attempted to photograph many bee flies—they are as skittish and difficult to approach as the tiger beetles I adore but, unlike the latter, not a subject of my research and, thus, harder to justify spending inordinate amounts of time attempting photographs. This one, however, was sitting so nicely on the ground, and with no tiger beetles around to demand my attention I thought I would give it a shot (pun intended!). I carefully assembled my rig and slowly crouched down to attempt a photograph, but before I could get in position the fly spooked and tried to fly away. As it took off, however, it hit a plant and fell to the ground on it’s back. As it laid there,seemingly stunned, I got myself into position and took a quick shot to make sure I had the settings and exposure that I wanted. In that regard, I couldn’t ask for better, but of course what I really wanted was a photograph of the fly right-side up, resting on its feet rather than its back. Just as I was considering what to do next, the fly abruptly righted itself and flew away, leaving me with this single, rather unconventional photograph. After perusing the bee fly pages at BugGuide, I was fairly certain this was something in the tribe Bombyliini, with the genera Bombylius and Systoechus being the likeliest candidates. Apparently the location of the r-m vein on the wing is an important distinguishing character between these genera, but I wasn’t quite sure about its location on the wing in this photograph. 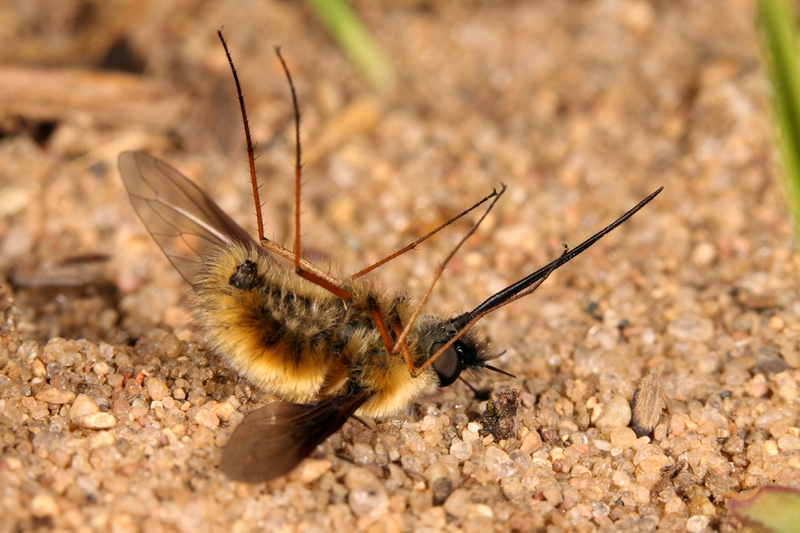 Nevertheless, some of the comments under the different species in these two genera suggested that members of Bombylius tend to be active as adults in the spring, while those of Systoechus tend more towards fall. I sent the photo to dipterist Joel Kitts at University of Guelph for his opinion—he confirmed that it belonged to the genus Bombylius and suggested its appearance was consistent with that of B. mexicanus—many thanks Joel! This entry was posted in Bombyliidae, Diptera and tagged bee flies, entomology, flies, insects, Missouri, nature, science. Bookmark the permalink. Very clean photo and an unusual position of a bee fly! Bees are mostly happy buzzing in the air than falling to the ground. I don’t think I have noticed a bee fly or seen one yet; and this bee fly landed on its back. Nice shot! The first time I ever actually got a chance to take a picture of one of these, I watched as it came flying along, settled down on the concrete in front of our garage, and . . . died. Just like that. So I took a bunch of pictures of the posed corpse. But I really have no idea what could make a fly die abruptly like that. Do flies have the equivalent of heart attacks? Or strokes? Or do they reach the end of their programmed life span, and just sort of turn off? Oh my! What a skittish little creature. I think, along with your story behind the photo, that this is a great shot! Such a good shot! I shared it on twitter yesterday, and it got “news-spotted” on the Ukulele Daily (http://paper.li/mandolinchick/ukulele). I thought you might want an explanation as to how your photo wound up there 🙂 Big fan of your photography and of beetles in general! Thank you Nicole. Your kind remarks are greatly appreciated.